Quarry caves above a north Wales seaside resort have been sealed off, preventing homeless people using them for shelter. Fencing has been replaced across the sites on the Great Orme in Llandudno, Conwy county. A local charity said it left some rough sleepers without anywhere to go overnight. Conwy council said it was necessary to clear the areas and repair perimeter fencing. Brenda Fogg from the town's Hope Restored charity said the decision would just move the problem to other parts of the town. She described the lives of some of those without a roof over their heads in Llandudno as "a fight for survival". "I don't know why it's been done. It's hit a lot of my lads quite hard," said Mrs Fogg, whose charity runs a drop-in centre for homeless people in Llandudno. "At least they were not in the town and they were out of the way. There's not a lot of other places they can go." 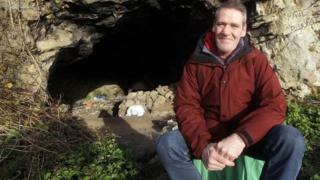 The plight of those sleeping rough in the town was highlighted a year ago by the case of a 52-year-old man who had turned to the caves for shelter. Conwy council, which maintains publicly owned parts of the Great Orme headland, said: "Periodically it has been necessary to clear the old quarry sites of rubbish and repair the perimeter fences."